Few details are available regarding this incident, but then how many do you need? Last week in Tulsa, a woman noticed a man "covered in blood" stumbling around the parking lot of an apartment complex at about 1 a.m. When police arrived, the man told them that he and his roommate had been fighting, and police found that both men had cuts all over their bodies. The fight had begun, they said, because they had been "arguing over their mobile phones." Most reports of this incident describe it as an argument about whether "iPhone or Android" is better, but that isn't strictly true, at least according to the KTUL TV report (link above). In the clip, the reporter says that Man #1 told police that "he and his roommate got into a heated debate over whether the iPhone or the new Samsung smartphone is better." Emphasis added. "Android," of course, is an operating system, not a phone, although the term is often used as shorthand for any device that runs that system. 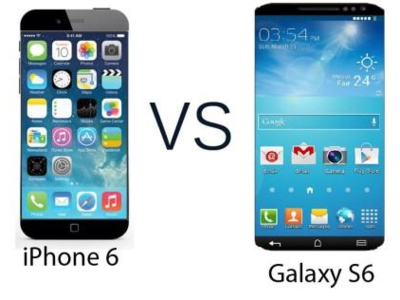 But the reporter's more specific statement suggests that the debate was about the merits of the iPhone 6 versus the Samsung Galaxy S6 in particular, not an argument over their respective operating systems. Which of course would have been equally stupid. According to the report, "Officials say the roommates' argument escalated, and they ended up stabbing each other with broken beer bottles." One had also smashed a beer bottle over the other's head, presumably before the broken-bottle stabbings proper got underway. The reporter added, unnecessarily, "Police believe alcohol played a big role in that fight." Both knuckleheads are expected to make full recoveries. KTUL ended its article by stating, "Police did not respond when our photographer asked which phone is better." That's funny, but given how some cops feel about smartphones in general these days it was also brave. "You mean, which phone is better for potentially recording us beating the crap out of a photographer?" the police might have answered him, and then everyone would share a laugh. Good times. I noticed that Apple Insider's coverage of the smartphone incident was carefully neutral on the iPhone-v-Android debate, which I found amusing but probably also wise.